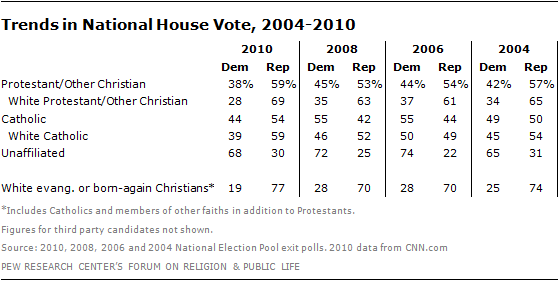 Analysis by the Pew Research Center’s Forum on Religion & Public Life of National Election Pool (NEP) exit poll data reported by CNN shows that white Protestants,1 a group that has long been one of the key components of the GOP coalition, voted for Republicans over Democrats in their congressional districts by a 69%-28% margin. This marks an increase of 6 points in Republicans’ share of the white Protestant vote compared with 2008, and an 8-point gain for Republicans compared with the last midterm election in 2006. At the other end of the spectrum, the religiously unaffiliated supported Democrats over Republicans by an overwhelming margin in 2010 (68%-30%). But the exit polls also show that Republicans made gains even within this staunchly Democratic group, picking up 8 points compared with 2006. This increase is comparable in size to the GOP’s gains among white Protestants, a traditionally Republican group. Initial reports based on exit poll results make it impossible to analyze voting trends of white evangelical Protestants relative to white non-evangelical (or mainline) Protestants. However, among all white voters who describe themselves as born-again or evangelical Christians – a group that includes Catholics and members of other faiths in addition to Protestants – 77% voted Republican in 2010, compared with 70% in the last midterm election. This analysis was written by Greg Smith, a senior researcher at the Pew Forum, and Scott Clement, a survey research analyst at the Pew Forum. It was originally published on Nov. 3 and updated on Nov. 12 to reflect reweighting of 2010 exit polls by the NEP. The report is based on preliminary analysis of NEP exit poll results as reported by CNN.com as of 9 a.m. on Nov. 12, 2010. If data are subsequently reweighted by the NEP, the numbers reported here may differ slightly from figures accessible through the websites of NEP member organizations. More comprehensive analyses, including examination of subgroups of major religious traditions, will not be possible until the raw exit poll data are published sometime in 2011.